“A traditional wristwatch has a relatively straightforward role: to tell the time. All that is needed is a hand for the hours, another for the minutes and perhaps a power reserve indicator to keep track of running time. Horological Machine No4 Thunderbolt has a hand for the hours, another for the minutes and a power reserve indicator. HM4 Thunderbolt tells the time. But HM4 Thunderbolt is not a traditional wristwatch. 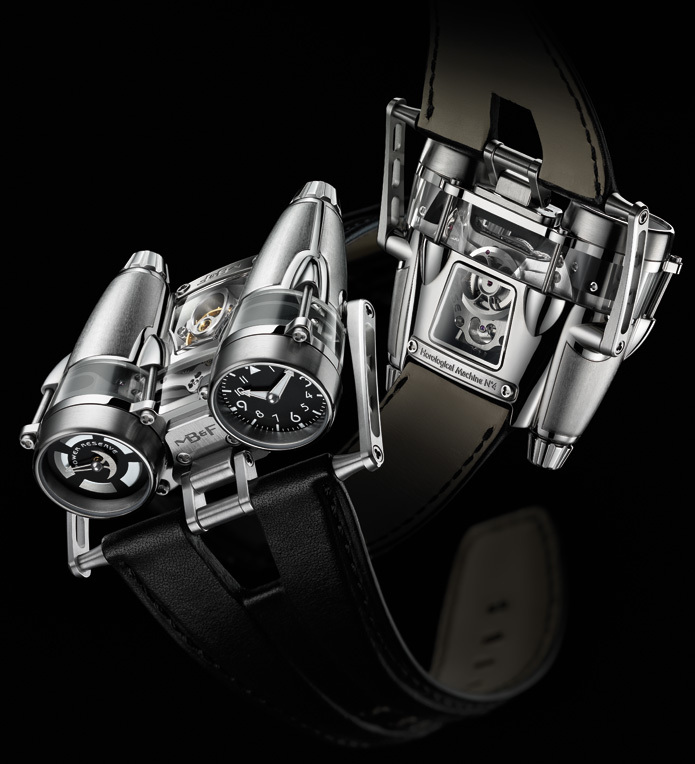 The aviation-inspired case and engine of the Thunderbolt are one. Neither would, nor could, exist without the other, yet each is so transcendental as to be able to stand alone as a work of art in its own right. The Thunderbolt’s engine is the culmination of three long years of development. Each of the 300-plus components – including the regulator and even the screws – was developed specifically for this anarchistic calibre. The sleek aerodynamic form of the Thunderbolt’s titanium and sapphire envelope has its roots in Maximilian Büsser’s childhood passion for assembling model plane kits. Every component and form has a technical purpose; nothing is superfluous and every line and curve is in poetic harmony.